Jennie Boisvert - Councillor for Clarence Park Ward: Update on the City of Unley’s Waste Management initiatives..
Update on the City of Unley’s Waste Management initiatives..
Green Industries SA (GISA), formerly Zero Waste, currently fund for a facility for householders and farmers to dispose of their hazardous wastes. This facility, located at Dry Creek, has limited operating times and this, with the distance of travel, may dissuade our residents from disposing of their household hazardous waste appropriately. To assist our residents for the safe disposal of household hazardous chemicals, we are proposing a 12month trial for offering a service for the collection and safe disposal of this waste from their home at no cost to the resident. Toxfree, is one of Australia’s leading environmental, waste management, health care and industrial services provider for the removal of hazardous and specialised waste. Toxfree are equipped with specialised vehicles and suitably trained staff to safely collect household hazardous chemicals from our residents’ homes. Residents will need to book for this service on-line via our website. Bookings are strictly limited to a maximum of 15 x Collections each month and will be scheduled to occur on the 4th Thursday of each month. Once filled, the next available collection date will be offered. Residents will be required to complete a Chemical Manifest Form to record the items proposed for collection, including terms & conditions and agreement to allow Toxfree staff to enter their property to collect items stored within a provided identifiable container. 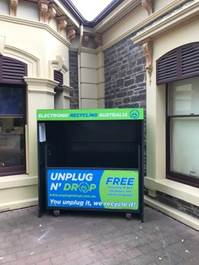 To help improve our recycling of electrical items, the City of Unley has joined with Electronic Recycling Australia in providing 3 convenient locations for residents to drop off unwanted electrical items. These FREE Unplug n’ Drop cages accept small electronic and electrical goods that plugs into a power point, uses a charger or is powered by a battery. Electronic Recycling Australia can deliver not just better environmental outcomes, but better community and social outcomes too. Their successful electronic and electrical recycling operation is an initiative of Minda providing services to people living with a disability through sustainable employment and enriches their lives through greater community participation and contribution. 411 Fullarton Road, Fullarton. Outside – access from Fullarton Road carpark, and is available 24/7. 75 King William Road, Unley. Inside the Depot site, and is only available Mon-Fri 8am-4pm. 72-74 East Avenue, Clarence Park. Outside – access from Canterbury Terrace carpark, and is available 24/7. Residents of the City of Unley can drop off small quantities of engine oil, batteries, fluoros, globes and mobile phones at the Works Depot, 75 King William Road, Unley. (Monday - Friday, 8am - 4pm). Our Civic Centre and Community Centres also accept small batteries and mobile phones. Residents will soon be able to purchase Kitchen Caddys and rolls of compostable liners, including dog bags from our Libraries, Community Centres and Works Depot, making it easier for collection and in turn, more use of the correct bag that can be placed into kerbside organics bins. Book Noooks for a good read.